Lotteries, by their nature, are a pure crystal of hope and expectation. The astronomical amount of cash awarded to those who overcome the astronomical odds has long drawn players like moths to a flame. Lotteries are even more special to Koreans, so many of whom suffer from seemingly endless competition. The structure and sheer randomness inherent to a lottery render it irrational to many, who may label it a “stupid tax” or “math idiot tax.” It must be questioned, however, whether lotteries are truly nothing but irrationality and dashed hopes—they may be entertainment, but they can act as a source of charity for the government and the underprivileged. On January 15, the Korea Lottery Commission (KLC) under the Ministry of Strategy and Finance (MOSF) distributed a press release named the “Survey on the Perception of Lotteries in 2017” with the help of Gallup Korea. A total of 1,039 adults participated, and the results found that Koreans’ attitudes toward lotteries have been steadily improving. Specifically, 74.5 percent of the respondents answered that their lives were better off with the presence of lotteries, which was 3.4 percent points higher than in 2016, and 20.3 percent points higher than in 2008. There were various reasons given for this: because the fund is used for the underprivileged (45.2 percent), because it gives hope and expectation (34.5 percent), and because it is enjoyable (13.5 percent). Despite this positive outlook on lotteries, however, the proportion of Gross Domestic Product (GDP) that lottery sales take up is comparatively lower than that of other Organization for Economic Coooperation Development (OECD) members. Could lottery sales in Korea surge to match OECD standards? The Encyclopedia of Korean Culture defines a lottery as “a ticket issued to dispense money collected from a large number of participants to winners, who have been selected by methods such as casting lots.” According to the Old Testament, which is believed to date back to 1,000 years before Christ (B.C. ), ancient people in the West distributed property via raffles. In the East, lotteries were first used around 100 B.C. during the Qin Dynasty in order to cover building costs for the Great Wall of China. The word lottery comes from an Italian word meaning fate. It acquired its current usage during the Geneva local council election of 1519, where five officials out of 90 were selected from a lot and onlookers used the word to refer to the election. Lotteries were first introduced to Korea during the late Chosun Dynasty in the form of the rudimentary santonggye and jakbaekgye. The modern form of lotteries appeared in Korea in 1947 as a means of gathering money to fund the Korean Olympics team at the time. One ticket cost 100 won, and total of 1.4 million tickets were distributed. The first prize was one million won, which amounts to 500 million won now when accounting for inflation. Thanks to this lottery, about 80,000 dollars were collected, and these funds enabled the Korean team to compete abroad. Later on, numerous raffles were introduced for purposes such as helping disaster victims or reinvigorating Korean industries. Currently there are four main lotteries in Korea. Sports Toto was launched in 2001 as a “sports promotion ticket,” in which participants received dividends based on their prediction of the outcome of sport competitions. The following year was an important one for lotteries because Nanum Lotto 6/45 (known simply as Lotto), the most popular Korean lottery, was launched under the motto “Rags to Riches.” Lotto players choose six numbers out of 45, and they receive monetary prizes based on a random draw. 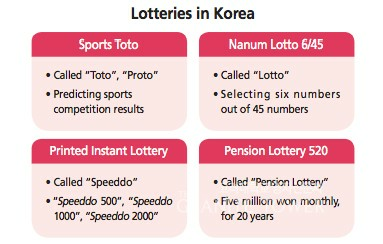 After Lotto was launched, a countless number of printed instant lotteries were integrated into Speeddo, whose individual tickets cost between 500 and 2,000 won. Finally, Pension Lottery 520 started in 2011. Here, two first place winners obtain a monthly “pension” of 5 million won for 20 years. These various lotteries have become a well-established part of Korean culture and can be seen everywhere. In fact, the Survey on the Perception of Lotteries in 2017 revealed that 57.9 percent of respondents bought a lottery ticket that year. Lotteries have been able to permeate Korean society so extensively primarily because tickets can be easily purchased at nearby convenience stores or kiosks. Due to such high accessibility, spending on lotteries is massive in Korea. Statistics on lottery sales released by the KLC shows that they amounted to 3.6 trillion won in 2016, and average sales for each draw was approximately 68 billion won. The number of Lotto shops in Korea is increasing day by day. In November 2015, the KLC declared that it would increase the number of Lotto shops nationwide from 6,000 to 8,000 over three years. Along with aggressively expanding the number of branches, the KLC will start selling Lotto tickets online starting December 2 this year. Even though the KLC announced that it would restrict online sales to five percent of total Lotto sales, many experts foresee that combined with a greater number of Lotto branches, its online division will propel Lotto sales to unprecedented heights. The Lotto draw is broadcast every Saturday. Come evening, phrases such as “Lotto numbers for the game” emerge as popular keywords on search portals. Many are poised for despair every week, however, since the probability of winning is extremely low. In Lotto, if players correctly guess three numbers out of the six drawn, they land a fifth-place prize, and when they correctly guess all six numbers, they are awarded the top prize. Phrased as such, winning fifth place or even ascending to the top does not seem too daunting a prospect, but in reality, the chances of winning Lotto are as narrow as they come. One has to overcome odds of 8,145,060 to 1 in order to win the top prize. Even the probability of receiving a fifth-place prize is low at 45 to 1, approximately 2.24 percent. Professor Huh Myeong-Hoe (Department of Statistics) succinctly described the principle behind Lotto. “When humans encounter extremely large or small numbers, they become number blind; in other words, they are not able to properly perceive how large or small the numbers really are,” he explained, comparing the probability of winning Lotto with that of being elected President. Huh warned against approximating the probability of a Lotto win with that of getting struck by lightning or other such vague terms. Instead, a better comparison would be correctly guessing heads or tails 23 consecutive times—which has odds of 8,388,608 to 1. The probability of winning Lotto is clearly extremely low; on top of that, its structure reveals that buyers always end up with the short end of the stick. Normally, the total revenue from lottery sales covers the prize money, the lottery fund, and the lottery’s operating costs. In the case of Lotto, KLC gives out 50 percent of Lotto sales as prize money. Simply put, people are paying 1,000 won for a piece of paper whose expected value is 500 won, which is a bad deal for any buyer. Moreover, this figure includes the first and second prizes, which are equivalent to a few hundred million won and are extremely rare. When considering only the fourth and fifth places, whose prizes are much lower but much more likely to be struck, it is revealed that the expected return on a Lotto ticket is only 112 won. 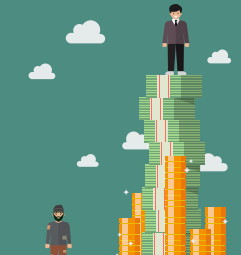 Even if a player somehow manages to gain one of the top three prizes, he or she would have to pay an enormous amount of their winnings in income tax, which ranges from 22 percent to 33 percent, thus decreasing the expected return further. If the first-place winner of Lotto wins two billion won, an average of 627 million won is seized by the government as income tax and only 1.37 billion won is left. Likewise, the winner of the Pension Lotto receives only 3.9 million won monthly, not five million won as advertised because 22 percent of the monthly pension is subject to taxation. Consider the following numbers: 40.7 billion won, and 314.9 million dollars. They are the highest winnings of all time for Lotto in Korea and Powerball in the United States (U.S.), respectively. Under the “Rags to Riches” motto, people who have lost themselves in lotteries in order to gain such enormous prizes have always been frowned upon by society. 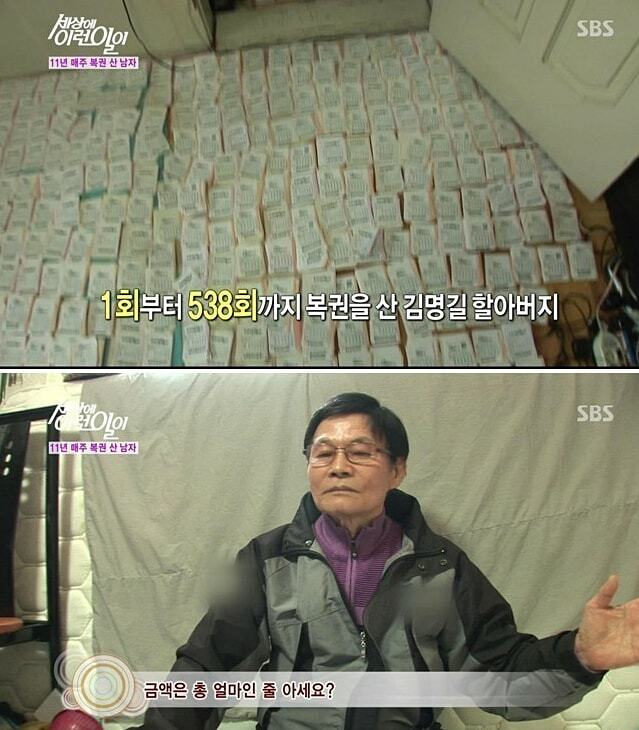 The television (TV) program “Instant Capture: Oh My God” hosted by SBS spotlighted Kim Myung-gil, a man in his seventies who bought a Lotto ticket every week for 11 years, which is the equivalent to 538 games. “I could cover my entire house with my Lotto tickets,” he lamented in an interview for the program. According to Kim, he has spent about 250 million won in total, but received only 3 million won in prize money. Nanum Lotto explains how overindulgence in lotteries develops over time. According to this institute, lottery addiction occurs in four stages. In the first stage, a potential addict believes that their financial difficulties can be waved away in “one shot,” namely by winning the lottery. In the second phase, they begin to buy more tickets, thinking that purchasing more means a higher likelihood of being the winner of the draw. Those in the third stage begin to spend their time and money on lottery analysis, and they begin to socialize with others who are obsessed with lotteries while ignoring their family and friends. In the final stage, the addict faces the terrible consequences of their addiction such as sinking into despair and ending up with massive debt. Korean society is also plagued by a number of firms claiming to predict winning Lotto numbers, most of which use slogans such as “Become a winner of the first-place prize within five days” and “80 first place winners so far.” These corporations exploit the hopes of people who want to increase their probability of winning Lotto, which seems naturally impossible to others. Visitors to their websites can easily see reviews by those who won Lotto thanks to the firms, and they are soon convinced that the site users receive massive amounts of prize money. On top of that, visitors are flooded with technical jargon such as “excluded numbers” and “fixed numbers,” which fool them into believing the prediction companies. However, Huh explains that the arguments made by these corporations are not trustworthy. According to him, the prediction companies can successfully explain the Lotto results of the past but cannot predict future results. He suspected that factors such as the order of the balls as they are put into the drawing machine and the difference in the air output could contribute to the uneven distribution of the numbers. In addition to the prediction companies, he was also suspicious about so-called “Lotto hotspots,” shops that allegedly produce many Lotto winners. Huh made it clear that buying Lotto at the hotspots would not increase the winning probability; rather, the sheer number of visitors that buy their tickets at the hotspots, drawn in by the hotspots’ astounding record, is why they boast a long list of lottery winners. Those who come out on top despite the slim chance of winning the lottery always become targets of envy. However, a sizable portion of the winners fail to use their prize money wisely. Earning an astronomical amount of money that they have never seen before in a short period of time confounds the winners, many of whom have not come into possession of such an amount before, and since they have no idea how to use their winnings, they squander it. As a result, the handful of winners end up buried under mountains of debt, with their financial situation worse than before their lucky draw. A typical example is a man identified only as Kim, who received one of the biggest prizes ever in Korea, 24.2 billion won, in 2003. After winning the lottery, Kim invested his money in the stock market and established a hospital without any specific plan for asset management; ultimately, his investments yielded very little actual returns. As his financial situation spiraled out of control, he resorted to online fraud, and was eventually arrested by the police. Through the lottery, he was given a chance to change his life, but it ended up ruining his life instead. Despite Lotto players’ desires for riches, from a logical and statistical standpoint, constantly spending money on lottery tickets is irrational. The possibility of winning the lottery is lower than that of being struck by lightning, and even if someone did win, the chance is even slimmer that they won the first-place prize. Despite the statistics, why do people bet their money on the game? What motivates people to test their luck? The most obvious reason is because they yearn to turn their life around in an instant. The dream of becoming a billionaire overnight fuels their irrational and constant purchase of lottery tickets. Some might argue that it is unrealistic for people to expect to receive a disproportionately auspicious compensation compared to their minimal effort, which is hard to refute. However, the suffocating conditions of the status quo make people long for a way to move into a higher social class. Given a social environment that renders it difficult amass riches based only on individual effort, it is easy to see why the demand for Lotto tickets, a shortcut of sorts to immense wealth, is skyrocketing. Needless to say, the opportunity to enter high society with only 1,000 won is appealing to many. “Underlying consumers’ lottery ticket purchases is their hope to make a big fortune on a single occasion, which is hard to achieve with normal labor. It is unrealistic, but still gives them hope. 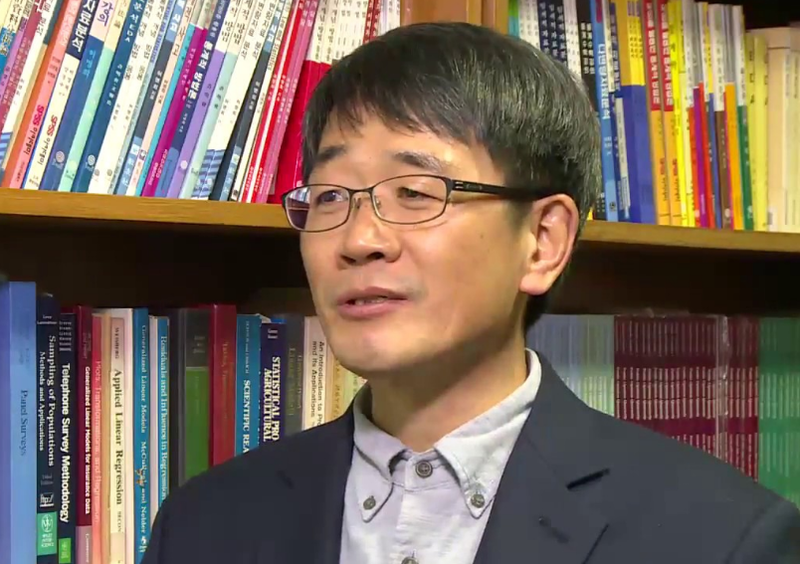 Young people who suffer from low wages, expensive house prices and other difficulties easily rely on these hopes,” Professor Shin Kwang-yeong (Department of Sociology, Chung-Ang University) stated in his interview with Hankyoreh. However, it is evident that the lottery does not give out money proportionate to the eagerness of the players; that is not how it works. This is why the lottery is often described as using hope as a means of torture. Should Lotto be considered just another form of gambling that leeches money off people and only gives them false hope? When players purchase Lotto tickets, the money from ticket sales become part of the lottery fund. The lottery fund has been set up by the government as a means to transparently and efficiently manage and utilize the financial resources gathered by running the various lotteries. The fund includes profits from lottery sales, returns from investing parts of the fund, and unclaimed prize money. The size of the fund increases alongside lottery sales, with the fund accumulating 1.7 trillion won last year. Contrary to popular expectations, the majority of the Nanum Lotto fund is actually given back to society. 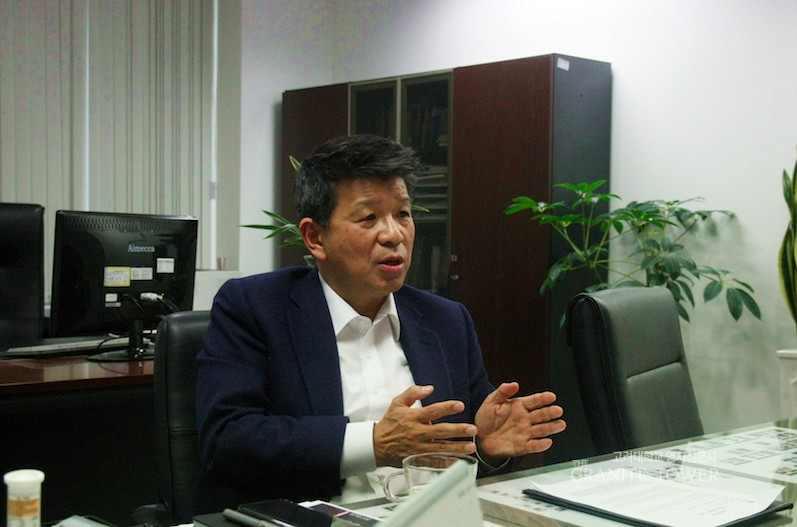 “35 percent of the fund, legal distribution, is used for businesses designated by the law, and 65 percent of it is used for public services selected by the Lottery Commission, mostly for the underprivileged,” explained Park Jung-hun, the Chief Executive Officer (CEO) of Nanum Lotto. The legal distribution is limited to 10 governmental organizations, such as local governments. In 2015, about 5.4 trillion won from the lottery fund was given to these organizations and most of it was used for the citizens. In 2016, 33.7 percent of government revenue came from the lottery fund. According to the statistics provided by the National Tax Service (NTS), the lottery fund ranked second in the list of contributors to Korean government revenue. This is higher than renowned companies such as Hyundai Motors, SKhynix, LG Chem, and Pohang Iron and Steel Company (POSCO). In other words, the money consumers pay for lottery tickets does not come to nothing; it goes back to their community and has a hand in enriching the welfare services they receive. The fund is not only used for government expenses, but also for various public services. These include rental housing for low-income families, furnishing veterans with welfare and healthcare services, establishing arts and culture organizations for the disenfranchised, and multiple other public projects. 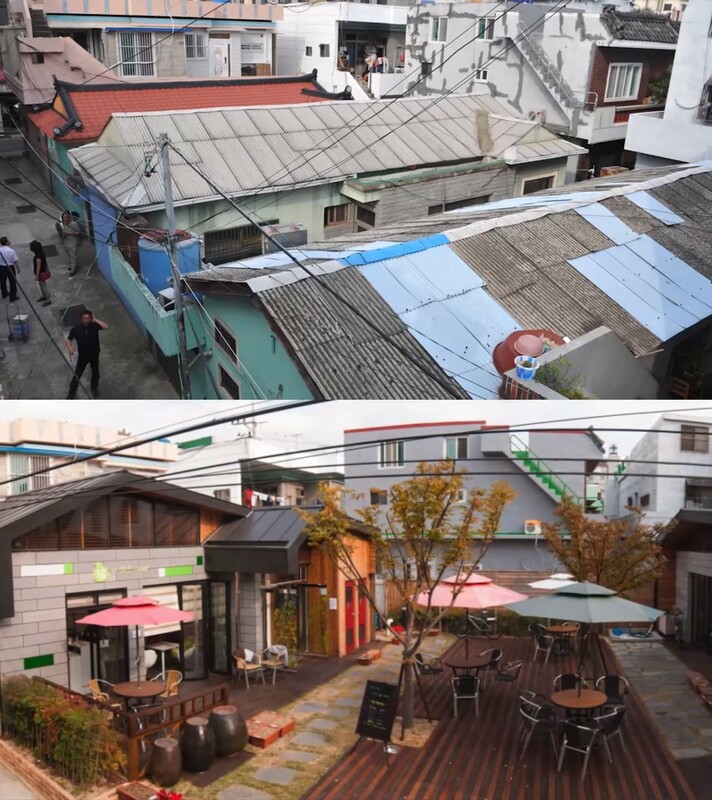 One major public service supported by the fund is “Happiness Village” in Busan. This project targets the impoverished and dilapidated regions of the city and attempts to morph them into a desirable place to live. For instance, the project paints flowers all over an obsolete byway to improve the urban environment. Lotto is a game that can lure individuals into neglecting other parts of their life and their family for a collection of numbers written on plastic balls. Checking the winning number, many think they missed the first place by a narrow margin, expecting their next purchase of a ticket to make them a billionaire. According to statistics released by the National Gambling Control Commission (NGCC), 5.1 percent of Korean citizens are addicted to lotteries, which is two to three times higher than the OECD average. In other words, it is quite easy for those who work for a lottery-related business to coast by on players’ addiction and earn easy profits. However, Nanum Lotto is implementing multiple methods to prevent their customers from becoming addicted to Lotto. Available on their website is a selfevaluation where consumers can test how healthy their Lotto behavior is, a section where one can set up purchase plans, and many other programs. The company frequently holds signature campaigns on the street, making people promise their healthy purchase of lotto. The removal of signs and advertisements that can exacerbate lottery addiction is also in progress. “Enjoy the lottery using only a small amount of money,” “You can only buy tickets up to 100,000 won in one purchase,” and “Ticket purchases and the receipt of prize money are only possible if you are over the age of 19” are the phrases that are always inserted in Nanum Lotto’s advertisements. “We would be the only ones in the world who ask the customers to moderate their purchase. The more they buy, the more we earn. But we ask them not to,” stressed Park. As a result, the Lottery Commission and Nanum Lotto achieved the highest level, Level 4, on the World Lottery Association (WLA) Responsible Gaming Framework (RGF) held in November 2017, the only certificate system in the world that evaluates the social responsibility of lottery and gaming businesses. On average, to move from Level 3 to Level 4 on the RGF takes about three years; however, Nanum Lotto reached the milestone within a year, which is the record for the shortest period of time taken to do so. Spurred on by its accomplishment, Nanum Lotto is ceaselessly working to establish a healthy Lotto culture in Korea. Since their inception, the lotteries in Korea have always looked upward. Their prosperity seems endless, and they have become so accessible that people can now purchase lottery tickets whenever and wherever they want. “The profit earned from the business does not go into the pockets of a select few rich people, but is used to financially bolster the quality of life for the everyday person, especially the underprivileged,” Park stated. The small, almost negligible hopes of numerous individuals are transformed into a larger hope for society and its members. However, Lotto is classified as gambling along with horse racing, casinos, and bicycle racing in Korea, and is thus subject to multiple legal restrictions. These restrictions have led the lottery industry to be comparatively smaller than those in other countries. “The average amount of money that OECD countries spend on lotteries is about 0.4 to 0.5 percent of their GDP. In Korea, this proportion is much lower, at around 0.25 percent,” said Park. Anticipating a stroke of luck without any endeavor can never be desirable. It is undoubtedly irrational to periodically invest money in an uncertain game. However, lotteries can still be rational in the sense that the consumers’ investment is used in positive ways within society. This is why it is hard to simply define lotteries as gambling. Hopefully one day, lotteries in Korea will shed their dishonorable title as a game of irrationality.